Known as Alaska's Emerald Isle, Kodiak rewards visitors to its port with a strikingly beautiful vista of verdant wilderness, craggy peaks and plunging fjords. Inhabited by Alutiiq natives for over 7,000 years, Kodiak is a small but vibrant port town on Kodiak Island. The inhabitants of Kodiak are passionate about the outdoors, with hunting and sport fishing being two of the most popular activities. 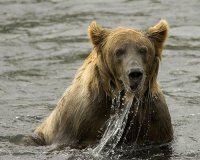 Authorities are careful to regulate these industries however, to protect local wildlife like elk, Sitka Deer, mountain goats, puffins and the famous Kodiak Bear, as well as fish including Alaskan salmon and halibut. A busy commercial port town, Kodiak welcomes the tourist industry but doesn't pander to it. There are no tourist buses, backpacker hostels or airport shuttles, but the opportunity to experience life in the Alaskan Archipelago is a fascinating one for visitors from all walks of life. Cruise ships dock at Kodiak's City Dock II, located about 1.5 miles (2km) south of the downtown area. A small island with less than 100 miles (160km) of roads, renting a car is the most efficient way to get around Kodiak. Bicycles are also available to hire for those who want to stay within the city. There isn't much in the way of public transport in Kodiak, but taxis are available. Hunting and sport fishing are popular activities in Kodiak, and licenses can be purchased at the town's sporting goods shop or online. Bird-watching and whale spotting are also popular outdoor activities, as well as kayaking, camping and hiking. Those more interested in local culture and history will enjoy a visit to the Alutiiq Museum and Archaeological Repository, which has artefacts dating back 7,500 years. For a small town, Kodiak has a large number of gift shops and galleries tucked around corners. Tourist shops in Mill Bay Road have t-shirts and hats emblazoned with the town's name, while the downtown mall is ground zero for local art, Russian crafts, and other locally-made Kodiak souvenirs. Look for the 'Made in Alaska' emblem to ensure you're supporting the local community.